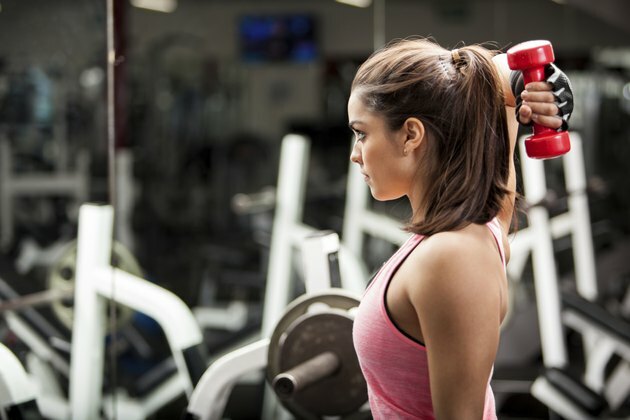 The benefits of a weightlifting routine for women include increased function in daily activities, reduction of bone loss, a lowered risk of osteoporosis, protection of muscle mass and an increased metabolism. Because women have less muscle mass than a men, there's no need to worry about bulking up. Concentrate on learning to master your form, aiming for two to three workouts a week that target eight to 10 muscles. Schedule one day of rest between weightlifting workouts to allow for muscle recovery. Warm up for five to 10 minutes. Cycling, jump roping, jogging in place or rebounding are all good choices. Start your routine by doing squats. Position your feet about hip-distance apart with your toes turned out slightly. Lower down until your hips are just above your knees with your tailbone extended back. Press back up, squeezing your glutes. Do two sets of eight to 12 repetitions. Get ready to do rows. Stand holding an 8 to 12-pound dumbbell in each hand. Start with your feet hip-distance apart and knees bent. Lean forward from your hips keeping a flat back. Pull your shoulders back as you lift the weights up to chest height. Keep your elbows bent and pointing back and your palms facing in. Do two sets of eight to 12 repetitions. Continue your routine with push-ups. Start on your knees. Place your hands about shoulder-width apart on the floor. Drop your tailbone and keep your back flat. Bending your elbows back behind you, lead with your chest and lower down as far as you can. Press back up to the starting position. Do two sets of eight to 12 repetitions. Do biceps curls. Stand holding a 5 to 8-pound dumbbell in both hands, palms facing out. Roll your shoulders back and extend your arms 6 to 8 inches in front of you. Curl the dumbbells to your shoulders contracting your biceps. Fully extend your arms to straight. Do two sets of 10 to 15 repetitions. Do triceps extensions. Holding the same weights as with the biceps curls, lean forward from your hips with bent knees. Extend your arms straight behind you in one straight line, palms facing in. Bend from your elbows, keeping your upper arms still. Extend to straight, squeezing your triceps. Do two sets of 10 to 15 repetitions. Do the plank. Start on your forearms and with your toes facing the floor. Lower your hips until your body is in one straight line. Breath your abs back by pulling your navel in. Hold for 20 counts, eventually working up to a full minute. Always practice good form. Work muscles largest to smallest. End each workout by stretching all the muscles worked. Drink water frequently. Do not be overly concerned with adding weight in the beginning. Supplement with cardio on your off days. Periodically swap in new exercises; this will keep you engaged and work muscles from different angles. Consider working multiple muscles with a single exercise to save time. Push-ups and planks are great choices. Do not skip the warm-up. It is imperative for preventing injury. Do not sacrifice form for heavier weight. Not all all exercises are appropriate for every person. Check with your doctor if you're unsure.